I’m excited to fill you in on how this RMT updated her spa decor and used my black and white birch tree wallpaper as a backdrop for a newspaper article, so you can get some inspo from her and maybe a little extra exposure for your biz, too! But first, I thought I’d fill you in on how she chose her wallpaper. 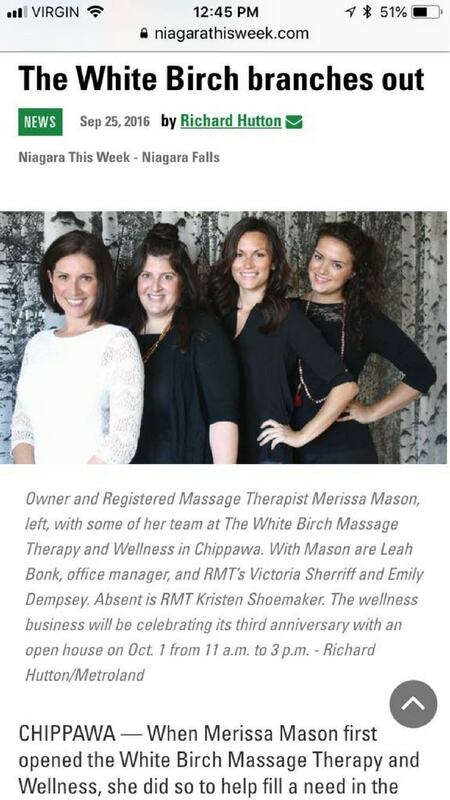 “I have a massage therapy and wellness clinic in Chippawa (a little village above niagara falls), its called The White Birch Massage Therapy and Wellness. I have been looking for black and white birch tree wallpaper for our new little yoga studio room. I feel REALLY overwhelmed figuring this out. 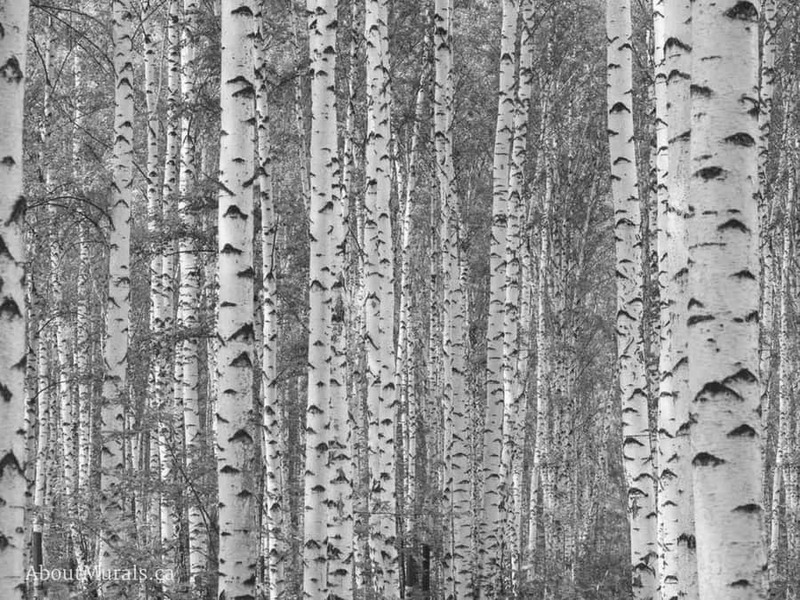 After showing Merissa all the birch tree wall murals, she picked Birch Tree Wallpaper Black and White. Even though my wallpaper is super easy to hang, Merissa had her hands full with the renovations and since I offer these services, it was a no brainer for her. 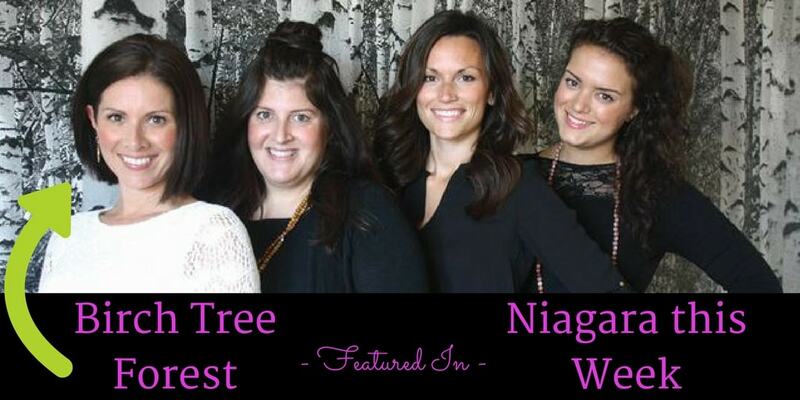 Niagara this Week interviewed and photographed Merissa and her staff in front of the birch tree wallpaper for the grand opening. It was the perfect extra exposure to give her newly opened studio a boost and something cool to share on social media. Wanna see more pics of the birch wallpaper in action – including more pics of Merissa’s studio? Check out my customer’s photos of this black and white birch tree wallpaper in my blog. Thinking of a mural for your space and want a hot deal? Join my newsletter and you’ll hear about all the latest sales, get exclusive coupons and get more inspirational pics.